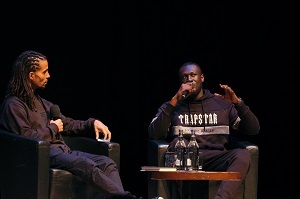 Penguin Live, in partnership with Spotify, hosted an event at the Barbican yesterday evening (7 November) to celebrate the launch of #Merky Books and Stormzy's first book Rise Up: The #Merky Story So Far. Guests were treated to the talents of spoken word performers curated by Apples and Snakes and selected by Stormzy, including contest winner Brandon Turner, Bridget Minamore and Caleb Femi. This was followed by a panel discussion with Benjamin Zephaniah, Malorie Blackman, and #Merky Books writers Chelsea Kwakye, Ọrẹ Ogunbiyi, and Jude Yawson, chaired by Akala. The evening finished off with a one-on-one interview between Stormzy and Akala. Stormzy said that the #Merky team allow him to be his true creative self. He said: "I know I'm going to be protected. I know everything's going to be in place. Value, especially in creative industries, especially in music, is tangible. With the best people you won't even know what's going on." On his position of influence, he said: "When injustices happen that are very close to my heart and I wanna say something, I probably have enough platform now that I can make something move." 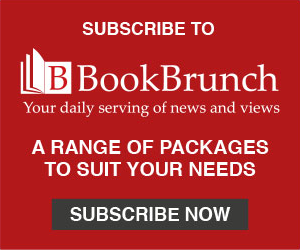 #Merky Books has been launched as an imprint within William Heinemann, a part of PRH UK, 'dedicated to publishing the best new fiction, non-fiction and poetry.' Curated by Stormzy, #Merky Books aims to publish two to three books per year, and forms a home for a new generation of voices. The programme includes an open submission competition to find new works of fiction, non-fiction or poetry, and a paid internship. Stormzy is a musician from Thornton Heath, South London. He won the BBC Music Award for Artist of the Year in 2017, and received two BRIT Awards for Male Solo Artist and Best Album in February 2018. His debut album, Gang Signs & Prayer, debuted at #1 in the UK album charts, the first ever grime album to do so. The album was subsequently nominated for the Mercury Music Prize and also won the Ivor Novello Album Award in June 2018. Rise Up is, according to Pengiun, an "innovative record of a meteoric rise, as told by Stormzy and Team #Merky. In four years Stormzy has risen from one of the most promising musicians of his generation to a spokesperson for a generation. Rise Up is the story of how he got there." Each guest received a copy of Rise Up included in their ticket.